Bacteria exist everywhere in nature. They are in the soil, air, water, and the foods we eat. When they have nutrients (food), moisture, and favorable temperatures, they grow rapidly, increasing in numbers to the point where some types of bacteria can cause illness. We all know that refrigeration slows bacterial growth. For food safety it is important to verify the temperature of the refrigerator. Commercial refrigerators must by law be set to maintain a temperature of 40 �F or below. An appliance thermometer can be kept in the refrigerator to monitor the temperature. This is critical in the event of a power outage. When the power goes back on, if the refrigerator is still 40 �F, the food is safe. Foods held at temperatures above 40 �F for more than 2 hours should not be consumed. 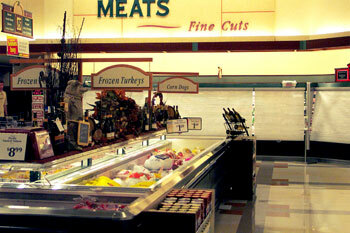 ECONOFROST heat reflective night covers keep the cold air inside the display cases at night or during a power outage. This helps you save energy and benefit from a longer shelf life of the foods in your cases. How Does ECONOFROST Night Covers Work? ECONOFROST thermal curtains are made from a woven aluminum fabric that blocks 70% of the ambient heat that normally enters open display cases. 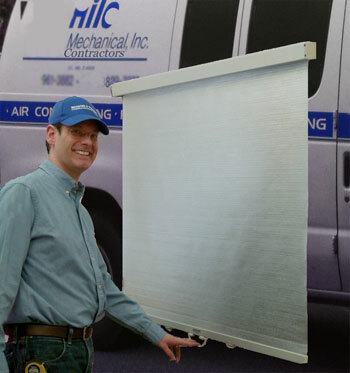 Of all the materials used for refrigeration night covers, aluminum is the most effective at reflecting heat. A number of test studies, including one by the University of London�s Refrigeration Department, have shown that aluminum has the lowest emissivity compared to other night cover materials. This means that aluminum, of all the other materials, such as plastic, does the best job of NOT conducting heat; heat from your store will find it very difficult to bypass the aluminum barrier so foods stay cool and produce moist and crisp. Perforations in the woven aluminum fabric of ECONOFROST night covers allow condensation to evaporate and prevent mildew from forming. ECONOFROST thermal curtains are designed to last for years, some installations are now over 10 years old and still saving their owners money everyday! A properly engineered night cover should be a one-time purchase designed for mounting and re-mounting on various cooler cases and refrigerated merchandisers as required. The woven aluminum fabric will not tear or rust. ECONOFROST night curtains are made from a food safe material to ensure superior hygiene for your supermarket. The woven aluminum fabric repels dust and moisture, preventing the growth of mold and mildew. Ask your refrigeration service contractor about ECONOFROST night covers and start saving today!